This KAL will have prizes! WHAT?!?! I know right? So how will this awesomeness work out? We will have 3 milestones during our KAL in which we will pick a randomly generated winner. Amanda and I will also throw in a giveaway of our own, but we’ll let you know which week that will be during the KAL. 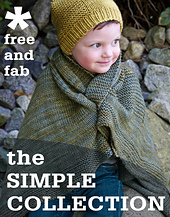 scarf, cozy socks for your dad, or a sweater for your little man, the Simple Collection will teach you all you need to know to make modern seamless knits for the whole family! 1. Please leave a post on our ravelry group’s forum with your name so we have a name with your ravelry ID to associate with it. We need your Ravelry names so the prizes can be gifted to your account. 2. As the KAL progresses we ask you to check in on the assigned check in dates. If you can’t make it to the store on the assigned KAL meeting dates it’s ok as long as you check in with the forum! If you want to be entered for the milestone giveaways you need to be actively participating, so a picture of your progress is enough! 3. Please post pictures or questions in the Harvest -KAL- thread.